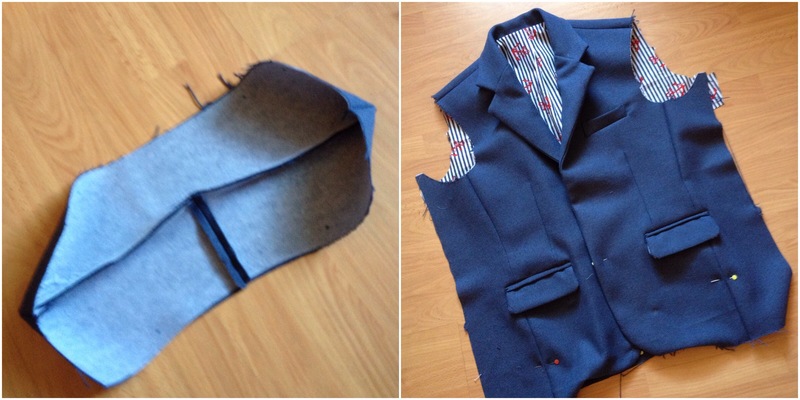 Enough shirts for now, it’s time to step it up a level with my 1st attempt at a jacket. I bought this pattern in my first wave of purchases, shirt, jeans, jacket… But one look at the amount of pieces involved had me put it to the bottom of my (small) pattern pile. 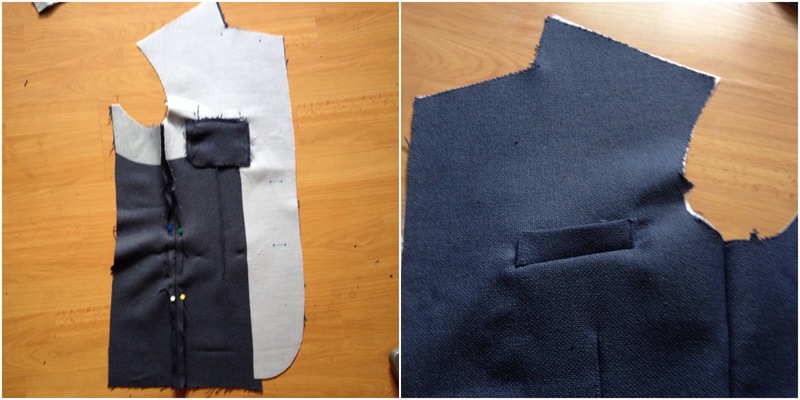 Every time I’ve been wondering what to sew next, this jacket pattern ends up in my hands, one time I even started tracing out the pieces… But there are SO MANY of them!! Well, more than I’ve ever had to deal with before any way. 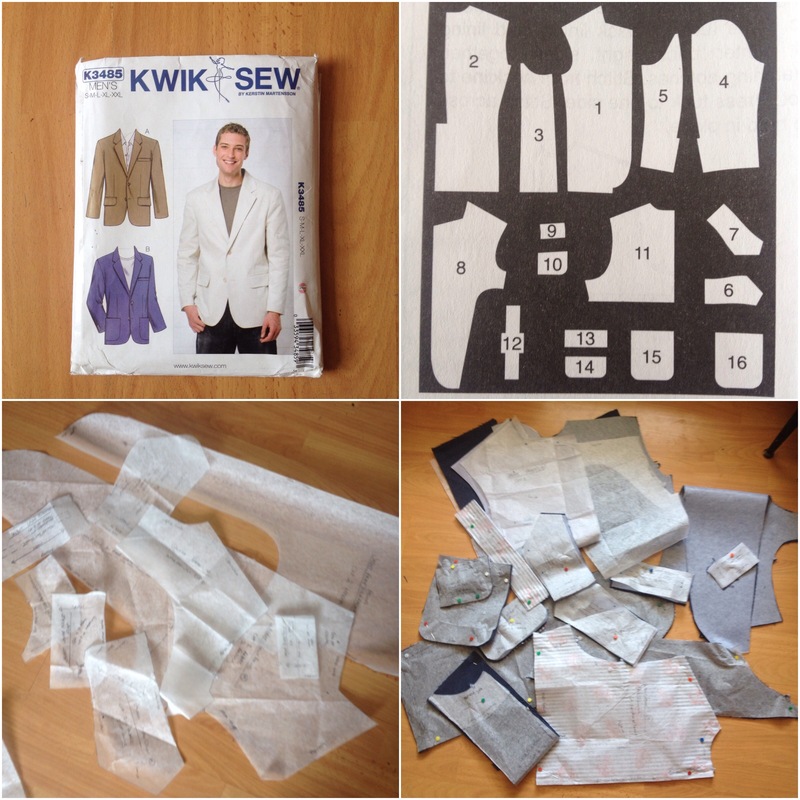 Kwik Sew K3485. View A. 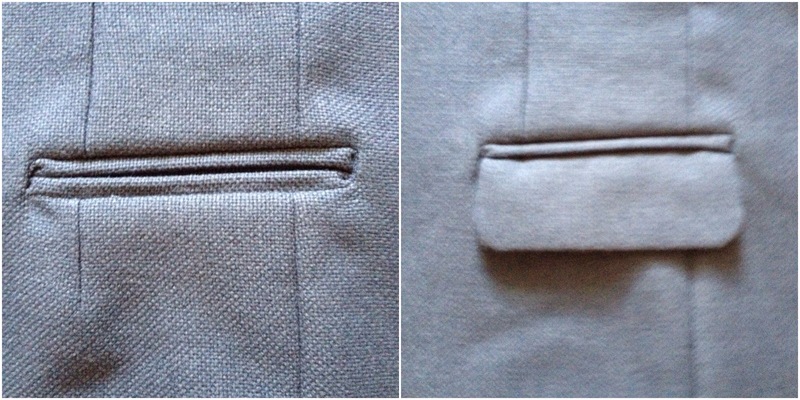 Double welt pockets with flaps. I said it was time to step it up a level. I went for size M as that seemed closest to my chest size. I’m using bargain fabric (£3pm from Cloth House, London). It looked like it would make a nice summer evening weight jacket. I used a mixture of light and medium woven and non woven fusible interfacing (using up what I had left over). 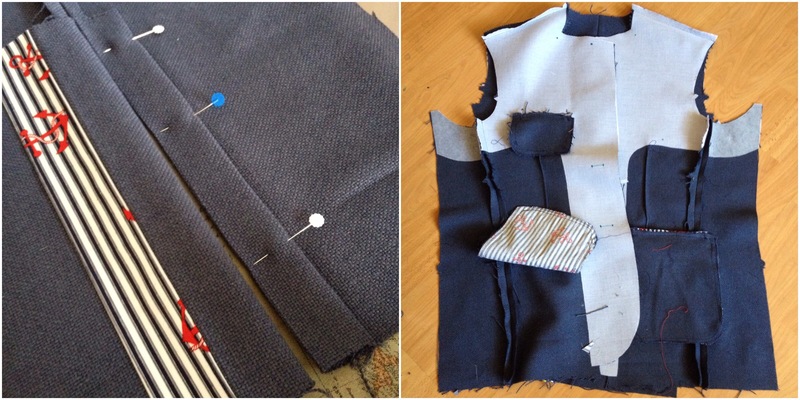 Even the thread from making my wedding waistcoat (more on that after June 27th!) matched perfectly, so I had everything I needed to get cracking. 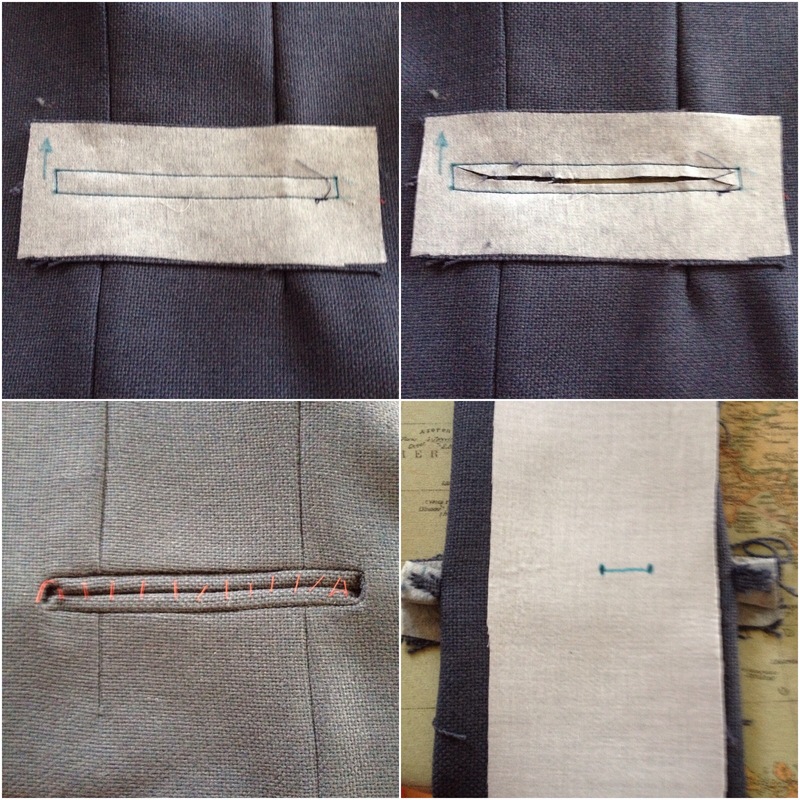 Front darts, attach side panels, then warming up with the top left welt pocket. Straight away I could feel that the fabric was not going to be as summery as I’d first imagined. The fusing added more heft than I thought it would. It’s the one I use for collars, cuffs, waistbands, everything! I decided there and then that I would never wear this jacket! Suddenly, the pressure was off and I could relax into trying out the new processes. Still, I loved putting the pockets together. And they didn’t finish up too shabby. I am confident that my next ones will turn out better. In fact, I’m really looking forward to doing them again. So, welts and flaps done (for better or worse), shoulder seams, half back lining, and then, this incredible collar… I was nervous of putting the collar in, as my shirt collars can be … erm… variable. But I followed each step carefully and really enjoyed the process. However, I’m still not convinced by the back flap. I think I followed all the steps, it just seems a bit rum. I think the contrast bit ended up in the wrong place, but I don’t know how… We’ll see. Read the pattern instructions until it makes sense.